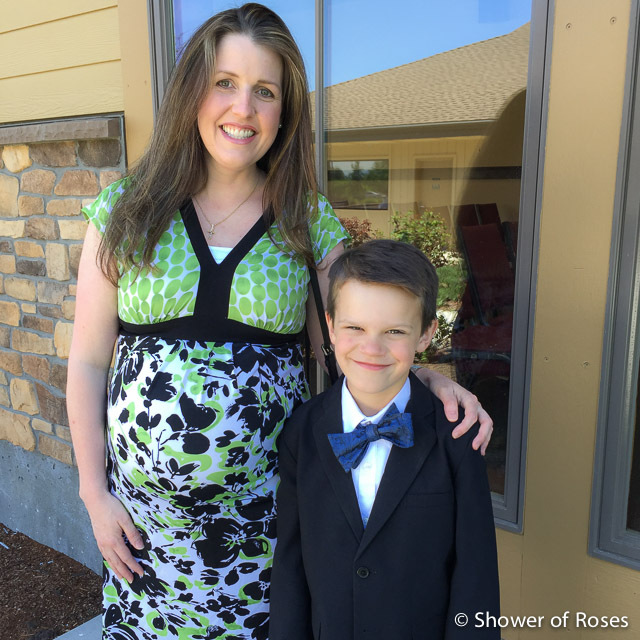 Toady one of our Godsons made his First Holy Communion! It was such a joy and blessing to be able to attend the Mass and watch him receive Our Lord for the first time! 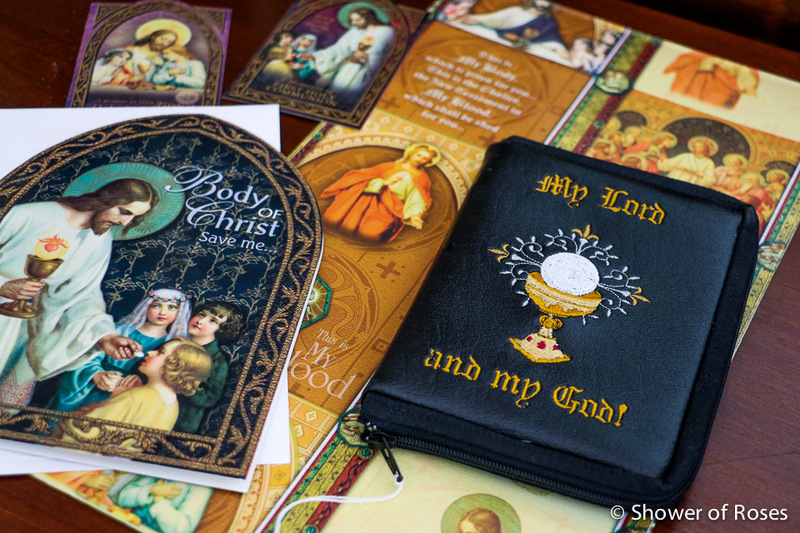 One of my favorite First Holy Communion gifts to give is the Jesus, Make Me Worthy prayer book. 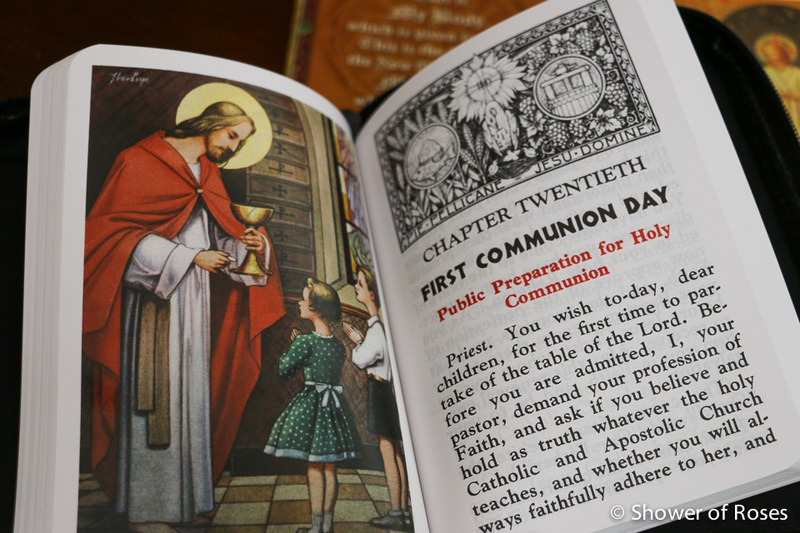 I've shared many prayers from this sweet and inspiring book here on the blog over the years. To go along with the book I also ordered a customized Missal Cover (with the Adorned Eucharist image) and had our Godson's name embroidered onto the back as well. I still haven't had a chance to post pictures of this year's Easter baskets, but many of our older children received missal or bible covers this Easter as well, thanks to some trade credit from past advertising combined with commissions from recent apron sales over at Catholic Cuisine! The covers are all gorgeous and I look forward to sharing some pictures of the rest sometime soon. 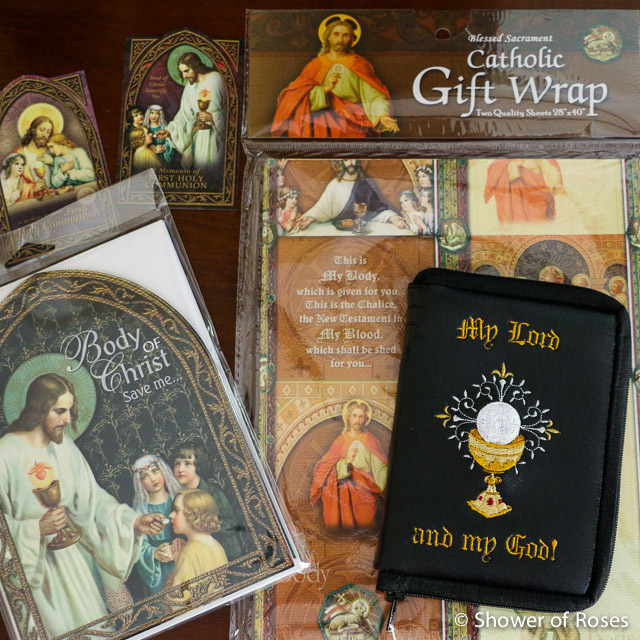 The Blessed Sacrament Gift Wrap, Holy Cards, and First Holy Communion Greeting Card all came from an amazing sale over at Trademark Catholic Stationary & Gifts last January! (I couldn't believe the prices... The gift wrap was marked down to just 25 cents a package and I ordered four packages for just $1.00! Thanks again for letting me know, Pam! I wish I would have posted a link here on the blog so you all could have taken advantage of the sale too... 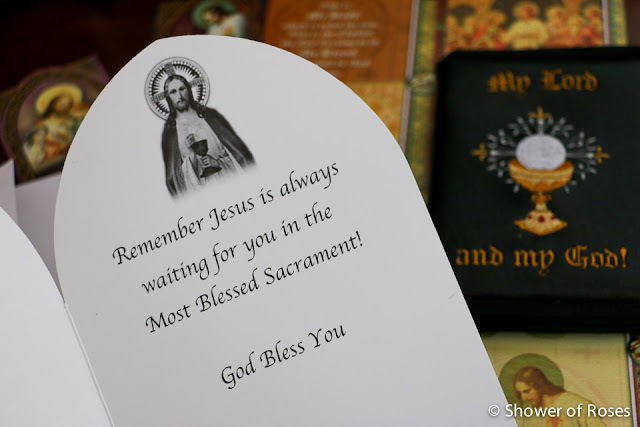 I was in the midst of recovering from the flu at the time.) 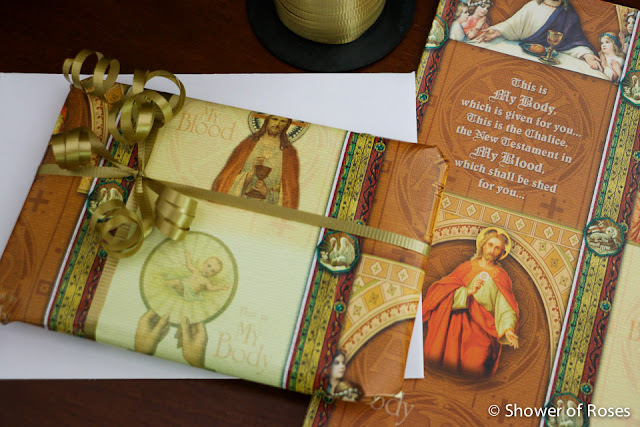 I stocked up and was able to give our girls some beautiful note cards and stationary in their Easter baskets! Congratulations to our handsome Godson! You can find many more First Holy Communion gift ideas in the archives.